We're going to start with this synthetic wig by New Look. It looks like pretty, shiny hair, but it's really just plastic. Synthetic wigs are my favorite kind of wig to style. 1. A wig that you want to curl. 3. Some way of holding the wig head in place while you style. Mine is stuck on a stand attached to the shelf, but you can just hold it with your feet if that works for you. 4. A comb or wig brush. 8. Pins. T-pins are best, but any kind of pin will work. 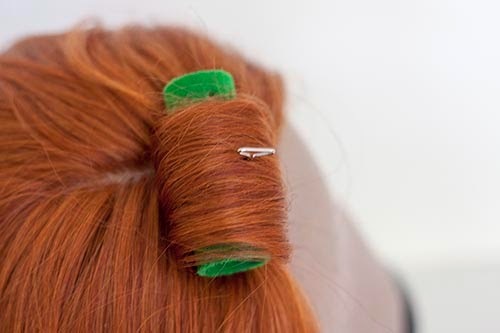 It should be long enough to pin through your roller and into the wig head. These are end papers for curling hair. Any beauty supply shop will have them. I always walk in and ask for "rolling papers," and then everyone laughs. 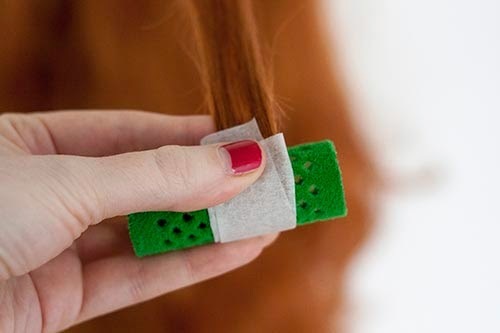 These papers let you curl the hair without getting wonky straight bits at the ends of your curls, which are ugly. 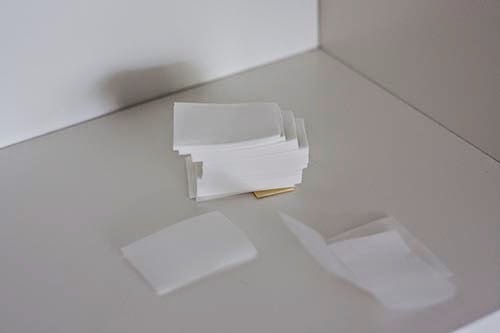 If you don't have these, maybe bits of tissue or toilet paper will work. But these are very cheap and easy to pick up at any beauty supply shop. OK, then let's go. Start with your wig on the stand. Section out a piece of hair. Put a paper behind the hair. 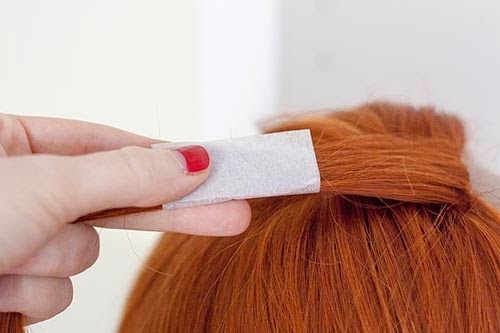 Fold the sides of the paper over the hair so the hair is encased in a little tube of paper. Hold the roller behind the paper tube. 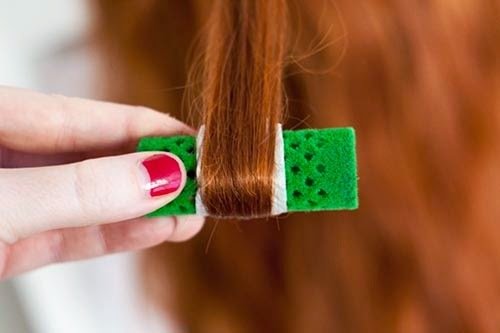 Drag the tube and roller together down the length of hair until you get to the end. Now is a good time to give the strip of hair a quick spray of hairspray. 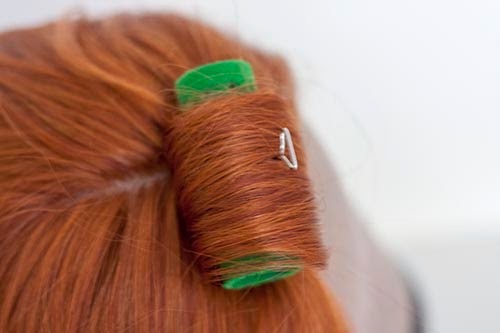 Start rolling the hair up around the roller. Don't twist the hair; keep it nice and flat as you roll. Finish setting the whole head that way. Then give the whole head another generous dousing with hair spray. Now apply heat. 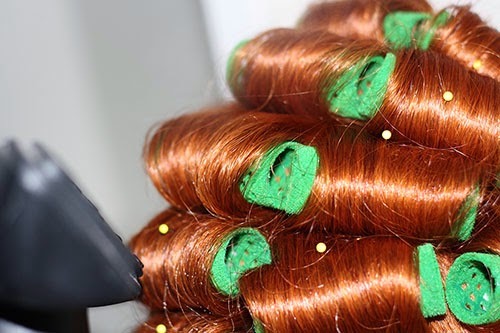 Using a steamer or a hair dryer, make sure each curl gets at least 30 seconds of heat. The hair should feel hot to the touch, but it should not be hot enough that you cannot touch it. If you can get it to the temperature of hot coffee, that's good. Move your heat source around over the curl, because you want to make sure the whole curl is hot, not just the surface. After you have curled one or two wigs, you will have an instinctive sense of when the hair is the right temperature. Do not allow your heat source to get close enough to melt the wig. If the fibers suddenly shrink and get frizzled looking, it has melted. 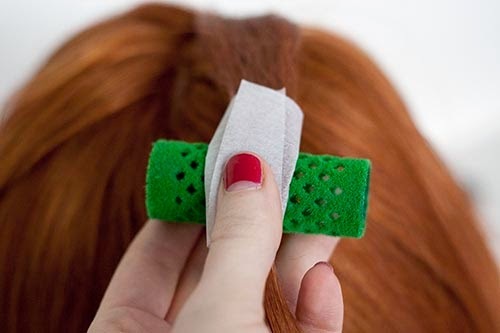 If you are new to wig curling, you might want to start from the bottom to get an idea of how far to hold the heat source from the wig. I hold mine about six inches from the hair. Now allow the wig to cool completely. 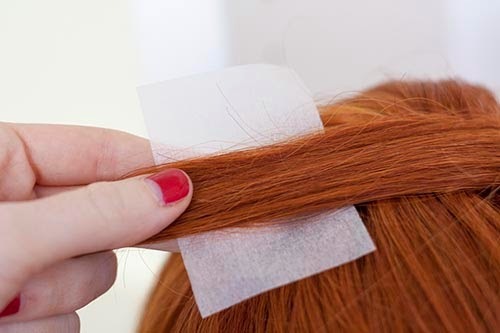 (If you have used a steamer, make sure the wig also dries completely.) 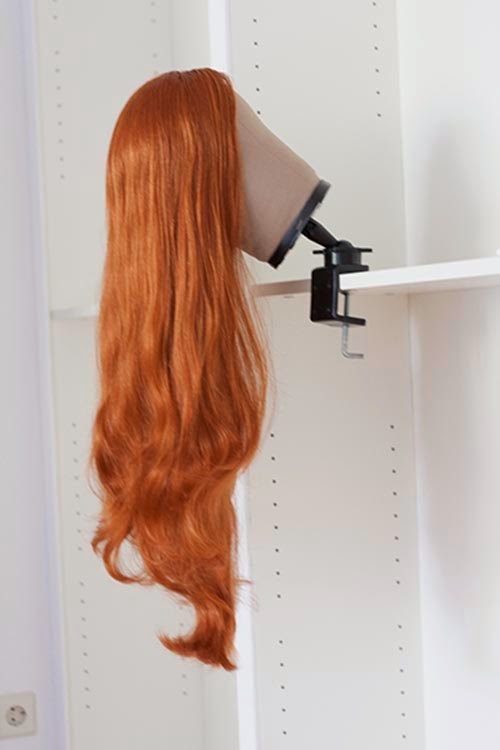 If you are impatient about getting your wig finished quickly, you can put it in an easy DIY wig oven, which I will show you how to do here. 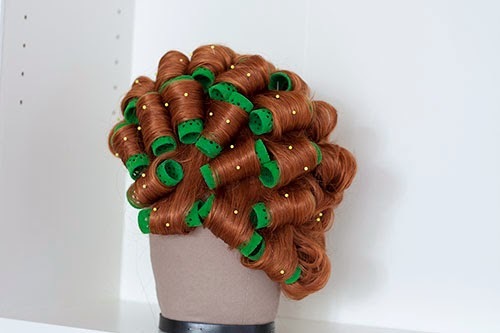 One the wig is completely cool and dry, take out all the rollers. And now the wig is curly and ready to be styled. If you want smaller curls, use perm rods or smaller rollers. If you want big waves, use bigger rollers. 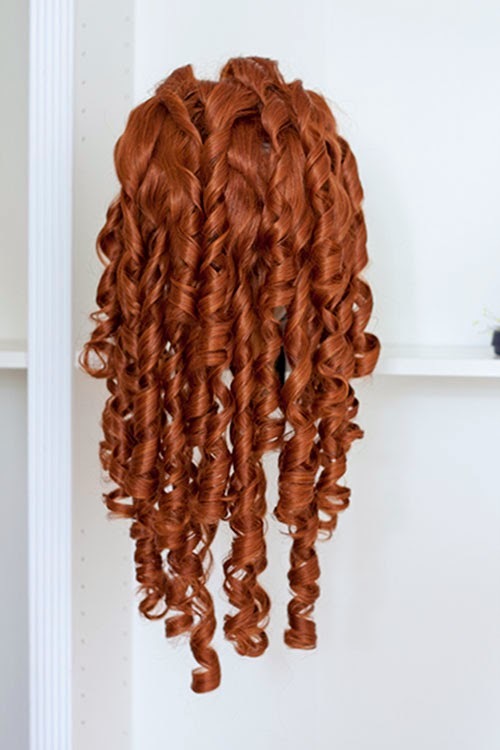 For an example of a wig style that I did with this kind of curling, check out my tutorial for how to make an 18th century pouf. 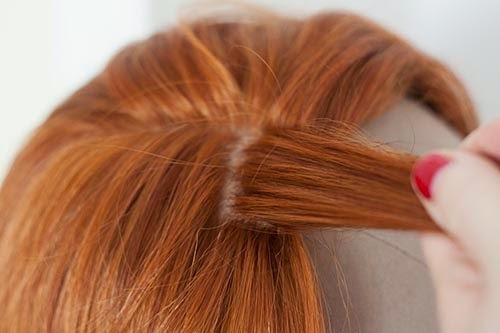 Thank you for your tutorial, I got some useful information that I will try on my doll wig. Hair accessories are also available in the market to serves you with the best of it, every single person wants to have human hair wigs that will look and feel like real hair which is a goal of course. synthetic lace front wigs are little not manageable, nor as soft as real hair; this is made from fake hair, and needs more care to manage, as this requires styling tools to manage and to prevent it from over-heating and this used for many purposes as sometimes, it is really hard to afford Remy hair extension, so this can be use in that case.